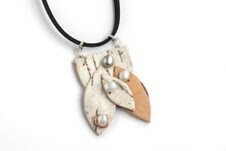 Definitely a statement piece, this dramatic necklace features a design by artist Deborah Bushinski featuring 3 birch bark leaves, fresh water pearls, and touch of copper wire. Sold on a 17" black suede cord, the pendant measures 1 5/8" x 1 1/4". Each piece is hand crafted in the USA. Minor variations in color, texture and size make each piece truly one of a kind.